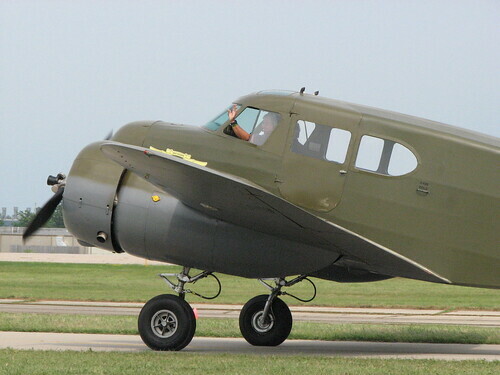 The Cessna T-50 Bobcat was designed as a commercial light transport and first flew in 1939. It is a twin-engine, low-wing cantilever monoplane, featuring 5-seat capacity, electrically actuated wing-triling edges flaps and an undecarriage consisting of electrically actuated retractable main landing gear with fixed fully castoring tailwheel. Construction consists of conventional wood and tubular steel frame with fabric-covered exterior. In 1940, the US Army ordered a military standard, the AT-8, which served as the basis for several additional models incorporating various changes in equipment and engines. Throughout its long service life, the Bobcat assumed many guises including civil and military transport, multi-engine trainer and general utility aircraft. After dutifully serving the Allies during WWII, some military Bobcats soldiered on in Brazil's Força Aérea Braseleira and with the Nationalist Chinese Air Force in the early post-war years. The aircraft was manufactured in at least 18 variants and sub variants, most notably the civilian T-50, US Army AT-17 (advanced trainer) and UC-78 (cargo/personnel transport), US Navy JRC-1 (USN equivalent to the UC-78) and Royal Canadian Air Force Crane I (trainer utilized for the British Commonwealth Air Training Plan). Total production was in excess of 5400 aircraft. A handful of Bobcats are still airworthy to this day. The Bobcat garnered many sobriquets based on its roles and appearance, some affectionale and some derisive ), most famously the Bamboo Bomber, but also: Useless-78, Brasshat, the Double-Breasted Cub, Rhapsody in Glue, the Wichita Wobbler, Boxkite and the San Joaquin Beaufighter. - Two sprues of 40 grey plastic parts. - One clear plastic sprue with 11 parts. - One bag with 25 resin parts. - Two photoetched frets with about 150 parts. The plastic parts are typical of what you can expect from a Czech short run manufacturer today: nice and smooth surface rendering, finely engraved panel lines and a limited amount of flash. Also, the soft grey plastic used is much more "user friendly" than the hard light grey plastic used some years ago. Only nitpick are the landing gear legs which are a little crude. Some cleaning work will be needed to make them look better than they are on the sprue. The clear parts are a little bit thick but their transparency is excellent, so the detail work in the cockpit will be visible at the end. 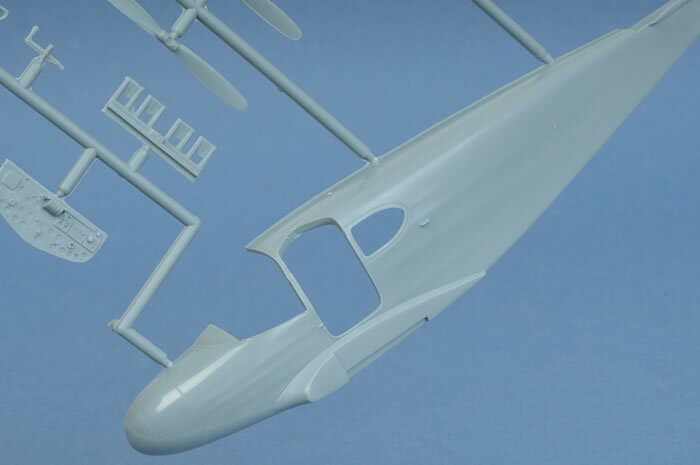 It is to note that the cabin "car door" has been molded in clear plastic as well, which is a very good move by the designers of the kit as it will make the assembly and painting easier. It will also be possible to display the model with the access door in the opened position to show the interior. Two style of glazings are provided, one for the civilian version and one for the military version. The resin parts made by True Details are of various quality. The smaller castings are excellent (propeller blades, hubs and spinners, exhausts, Tailwheel, ADF Fairing and antenna). The engines are good even if the detail is a bit soft on the Lycoming 9 cylinders engine. The Jacobs 7 cylinders engine is much better and is the only one to receive additional PE detail parts (ignition wires and oil lines). The wheels/tyres are of poor quality though. The problem is that the wheel hubs aren't centered. It isn't obvious on the pictures but it is sadly so. The photo etched parts very much look like as if they have been produced by Eduard (though it's written nowhere). One of the two PE frets is pre-painted. Quality wise they are excellent and will raise the level of detail of the model, especially in the cockpit area, to a very interesting level. Without them, the kit's interior would have been a little bare I must say. Some parts are also destined to the exterior. Overall a very usefull, if not mandatory addition to the kit. My only complaint about the proposed decorations is that if the "Songbird" plane is very colorful, the military machines are rather boring. If, like me, you don't want to do a civilian aircraft, I would advise you to make some Google search on the web and look after more interesting paint shemes. type in "Cessna Bobcat" or "Cessna UC-78" in the search bar and you'll see what I mean. The instructions are very nice. They are printed in color on three sheets of glossy paper folder so to form a 12 page booklet. The drawings are in color and (this is very interesting! ), the parts are represented to show the medium they are made of: grey for plastic, pale yellow for resin, light blue for transparent parts and fine blue lines for the PE parts. A quick look at the instructions and you know were to search for your parts... excellent idea! A color table is provided but with no references to any brand of paint. FS numbers are present for some paint ships though. Czech Model's "Bamboo Bomber" is a very nice kit. It is rather simple if you consider only the plastic and resin parts so it's good that a lot of photo etched parts are provided. Otherwise I would have said it's a basic kit. But like this, it's a great package that will allow you to build a detailed replica of the original aircraft. I recommend it to modellers with some experience with multimedia kits, especially with photo etched parts. Verdict: A nice kit of an important civilian or military trainer aircraft. Over 5400 were built! Forbidden You don't have permission to access /g2/49/435649/2/66390657.Ix10NlRi.jpg on this server.